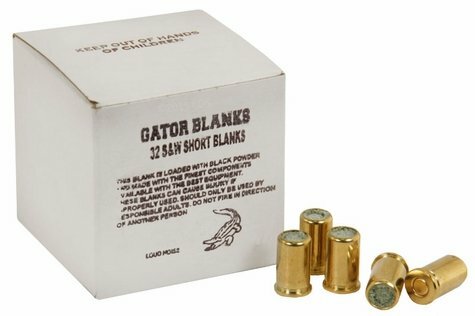 Gator S & W .32 Caliber Short Black Powder Blanks -- 50 ct. $39.95. These are a black powder blank and will require more regular cleaning of your Blank Starter Pistol. They also produce a brighter flash and more "smoke." We recommend them for older, started dogs. "We have found no problems with this product." We have found no problems with this product. "These are great shells and the price is hard to beat." These are great shells and the price is hard to beat. We use them to start track meets and have NO issues! I find them fine, but some of the other starters say that two or three shells fire of on a single trigger pull. Actually I Bought the 32 Blanks for a RETIRED U.S. Coast Guard LYLE Rescue Line Throwing CANNON. Naval Co. Mfg. made 1949 (Like ME) and Retired in 1952 due to ACCIDENTS! These CANNON can Flip Backwards and Recoil up to 150 FEET! The Firing Mechanism, LOCK uses a .32acp Black Powder Blank, to Ignite the BLACK Powder Charge, up to SIX (6) Ounces of GOEX Cannon Grade BLACK Powder. Mix Ups due to STUPID People Not Understanding SMOKELESS vs BLACK are DIFFERENT!! SMOKELESS Powder Results in a CANNON - B O M B - / / = DEAD Cannon Crew. THANKS For FAST SHIP!! Nice Product!! I use blanks to start track and field meets. These are the best buy I can find by several dollars per box. Very reliable and loud! Works as advertised. Used for starting track meets. "They work very well, love them a lot." They work very well, love them a lot. No problems at all. "I use these for track meets and they have been excellent." I use these for track meets and they have been excellent. So far so good. Since you cannot get Winchester .32 blanks I decided to try these. Working as advertised. They work well in a 7.62 Nagant. Prefer the Winchester's. These are awkward to carry and harder to use. Some of the bullets misfired from the gun on several attempts. Other than that it was a decent product and good price. Not compatible with 209 Primer Pistols. Not recommended for use in theatrical productions or indoors. Gator Blanks are loaded with black powder and made with new brass and florial styrofoam wadding for added safety. Made in Georgia, USA. 50 per box. Black powder blanks are the loudest type of blanks we sell.